Forbes thinks San Diego is miserable. Specifically, San Diego is a miserable sports city. Awww…that’s cute, Forbes. Thanks for that. Hold please. (insert 2 hours here) Sorry, had to get in a little mid day surf session on this gorgeous day… which is just like every day. Where were we? Oh yeah, Forbes. They have some crazy formula in their article for what actually makes a miserable sports city in their article. After reading their criteria, it’s tough to argue with the Top 4. But number 5 for San Diego? Home of the San Diego Chargers! Home of the San Diego Padres! 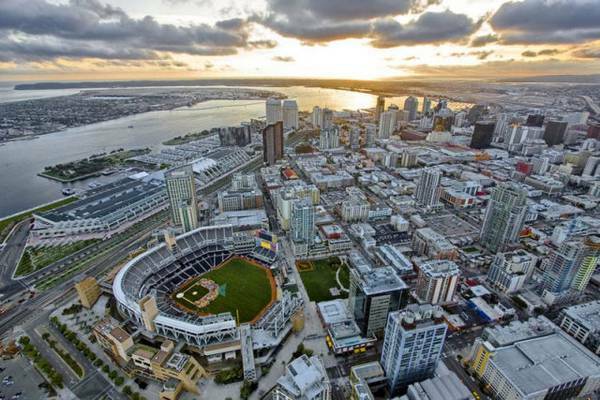 I know this article was posted by Forbes yesterday, but it must’ve been written a couple years ago… because clearly they have not been to Petco Park to see how awesome of a sports city San Diego really is. 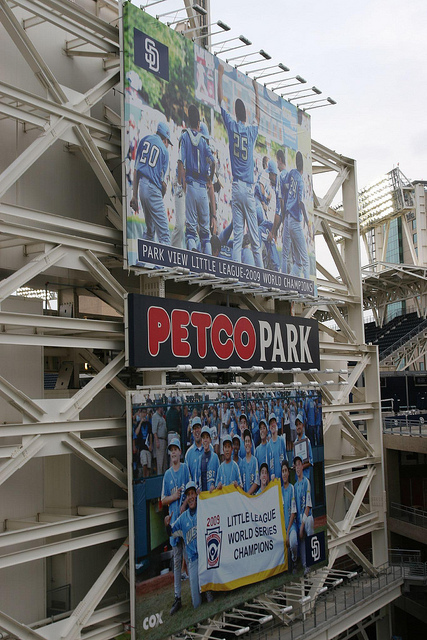 The Padres know how awesome they are… so awesome that they have this incredible banner of themselves at the ballpark. Wait, who is that? Ah crap, that’s the Little League champs from 2009er. What a wonderful sight to see walking up to the 2011 FanFest for the Padres, who play Major League Baseball. Damnit. If having a two year old Little League banner front and center on your MLB stadium doesn’t scream professional sports misery, I don’t know what does. Screw you, Forbes… for being so right. This entry was posted in Baseball, Football, MLB, News, NFL, Top 5 and tagged Chargers, Forbes, Padres, Petco Park, San Diego, Top 5, Top 5 List, Top 5 Most Miserable Sports Cities. Bookmark the permalink.